German-born, Paris-based photographer Jürgen Nefzger is known for ecologically minded series that pit hypersaturated shots of pristine landscapes against images of manmade industry. Fluffy Clouds (2003-2006), for instance, features idyllic landscapes in France, Germany, Spain, Switzerland, Britain and Belgium that ironically frame the iconic billowing clouds emitted by nuclear power plants. In Panta Rhei (2006), a photograph of melting Alpine glaciers is placed next to that of a bustling ski resort. 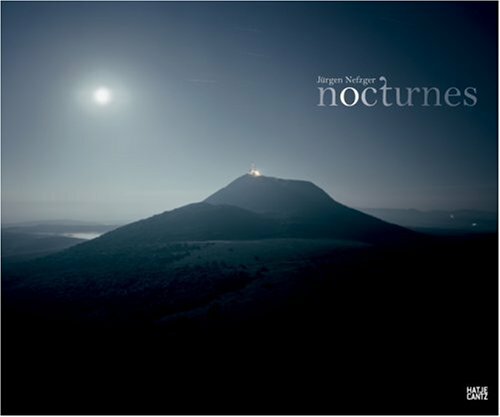 Nocturnes includes images taken in Clermont-Ferrand, France, at the foot of the Puys mountains, a chain of volcanoes for which the city is famous. The Puy-de-Dôme, the tallest volcano, sports a mass of visible telecommunication antennas. In this volume, Nefzger takes us on a journey beginning at the top of the volcanoes and venturing down into the city.